Bonnie Watson Coleman has served as the U.S. House of Representatives for New Jersey’s 12th Congressional District since January 3, 2015. The 12th District includes Princeton University and major parts of the Middlesex and Mercer Counties. Coleman is the first African American woman to represent New Jersey in congress. Coleman is a member of the Democratic Party, and was preceded by Representative Rush Holt, a fellow Democrat. Born on February 6, 1945, Coleman is originally from the city of Camden, New Jersey. She is the daughter of the well-known New Jersey state legislator John S. Watson. Coleman received her B.A. from Thomas Edison State College in Trenton, New Jersey (1985), where she was a member of the Alpha Kappa Alpha sorority. Prior to becoming a U.S. Representative, Coleman served as the 15th District’s member in the New Jersey General Assembly (1998–2015), going on to become the New Jersey General Assembly Majority Leader (2006–2010). She also served on the Governing Boards Association of State Colleges (1987–1998), serving as the chair from 1991 to 1993. The New Jersey Democratic State Committee elected Bonnie Coleman as the state chair on February 4, 2002, making Coleman the first African American woman to serve this position. In 2014 Coleman chose to run for Congress, running against Republican Alieta Eck. On November 4, 2014, Coleman won and assumed office in early January 2015. As a U.S. Representative, Coleman serves on the Committee on Homeland Security and the Committee on Oversight and Government Reform. As a U.S. representative, Coleman has done much work in the field of reducing prison recidivism rates. She has worked on the implementation of rehabilitation programs for incarcerated individuals, convening a lengthy series of public hearings on the topic of criminal justice reform. Coleman is a member of the Congressional Black Caucus and the Congressional Progressive Caucus, a left-leaning faction of the Democratic Party. On March 3, 2015, she was one of fifty-six Democratic representatives to boycott Israeli Prime Minister Benjamin Netanyahu’s speech to Congress. Bonnie Coleman resides in Ewing Township, New Jersey, with her husband William Coleman. She has three children (Troy, William, and Jared Coleman) and two grandchildren. Bonnie Coleman is a Baptist Christian. 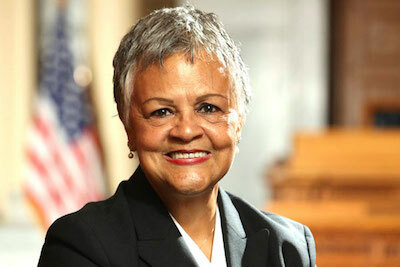 “About Bonnie,” Congresswoman Bonnie Watson Coleman, U.S. House, https://watsoncoleman.house.gov/about/full-biography; “The Voter’s Self Defense System,” Project Vote Smart, http://votesmart.org/candidate/biography/24799/bonnie-watson-coleman#.V3RwGzekc5R; “WATSON COLEMAN, Bonnie,” Biographical Directory, United States Congress, http://bioguide.congress.gov/scripts/biodisplay.pl?index=W000822; Times Of Trenton Staff, “Watson Coleman Wins Democratic Primary for 12th Congressional District,” NJ.com, Times of Trenton, 03 June 2014, http://www.nj.com/mercer/index.ssf/2014/06/watson_coleman_wins_democratic_primary_for_12th_congressional_district.html; “Bonnie Watson Coleman,” NJDSC, New Jersey Democratic State Committee, http://www.njdems.org/bonnie_watson_coleman; “New Jersey's 12th Congressional District,” The Encyclopedia of American Politics, Ballotpedia, https://ballotpedia.org/New_Jersey%27s_12th_Congressional_District; Mike Lillis, “WHIP LIST: 56 Democrats to Skip Netanyahu Speech to Congress,” The Hill, 9 Feb. 2015, http://thehill.com/homenews/house/232160-whip-list-dems-skipping-netanyahu-speech.